Cotswold Wildlife Park – Sunday 5th May – Adults/Carers £8, Children (3-16 years) £5, Children (0-2 years) FREE, person with DS goes FREE. There will NOT be a coach for this event, but if transport is an issue please contact kirstycurtis4@hotmail.co.uk and we will get something sorted. We will aim to meet at the main gates for 10.30am then you are free to explore the park as you wish, we will gather for lunch near the picnic shelter at 12.30pm but this is optional. DLA proof required. Thomley Activity Centre, Menmarsh Road, Worminghall, Bucks HP18 9JZ – Sunday 23rd June – Child/young adults £10 each including person with DS, parents/carers go FREE. There will NOT be a coach for this event, but if transport is an issue please contact kirstycurtis4@hotmail.co.uk and we will get something sorted. This venue provides entertainment for all ages in a safe indoor and outdoor environment, please feel free to look on their website www.thomley.org.uk you can bring a picnic lunch, or there is a café area to purchase food and drinks. Twinlakes, Melton Mowbray – Saturday 13th July – Adults/Carers £6, child prices under 3s FREE, 3-4 years old £3, 5-11 years old £6, person with DS goes FREE. There will be a coach provided for this event charged at £5 per person, person with DS travels FREE. If you require transport for this event please state this on booking form. Coach will pick up from Upper Mounts Car Park please arrive in time for departure at 9am. Leaving Twinlakes at 5pm. Summer BBQ – Sunday 8th September, Venue: The Freemason’s Hall, Lodge Farm Industrial Estate, Duston, Northampton NN5 7UL. 1-4 pm. A separate invitation will be sent nearer to the event. Christmas Party – Saturday 7th December, 12-3pm at County Cricket Ground Old Speckled Hen Suite – Separate invitations will be sent nearer to the event. Derngate Panto, Cinderella – Sunday 29th December 1pm – Cinderella will feature star casting, laugh-out-loud comedy, jaw-dropping special effects, stunning song and dance and plenty of boos and hisses, making it perfect family entertainmen. Emails will be sent for this event separately. Cobblers Down Syndrome Football Coaching, continuing every Sunday morning 10.30-12pm – term time only, there is a small charge per week. The team are looking for new players to join, age 5-25 years, girls and boys. This is run by Russell Lewis from Football in the community. Northampton Sailability, Pitsford Reservoir, Brixworth, Northampton NN6 9DG – Sailing for the Disabled. Sailing is available every Monday, Friday and Saturday (excluding Bank Holidays) from April to the end of October for individuals sec@northamptonsailability.org.uk mobile 07952 579380. The committee would like to welcome new members to the group. We now have over 80 families registered with our charity. We are beginning to distribute New Baby Welcome Bags to congratulate families in Northamptonshire, when they have a baby born with Down Syndrome, if you know or hear about any new families please inform us so that we can attempt to reach out to them and let the DSGN support start as soon as possible. We also have literature for the Positive About Down Syndrome campaign, which we are trying to get to any expectant parents considering screening, so please if you know anyone in this situation sign post them to www.positiveaboutdownsyndrome.co.uk website, or find the group on Facebook, if you require any information please let us know. Let’s all raise awareness together. Drinks can be purchased from the bar. If you wish to eat with your family please look at The Picturedrome menu (online) and include this on your order below, you will need to pay this yourselves at the bar and all food orders must be back by Friday 26th October 2018 Thank you. May we please remind you that your children are your responsibility during the event. OF PEOPLE WITH DS…….. NO OF OTHER CHILDREN…….. NO. 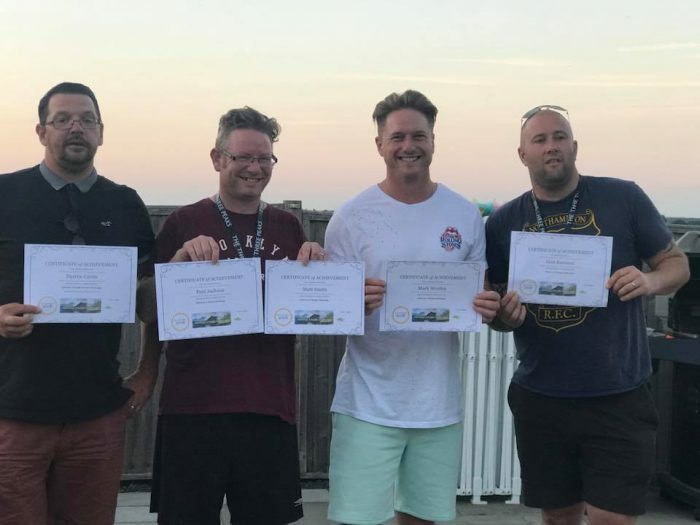 OF ADULTS……..
Homemade Cheese Burger & Chips …………………………..………………………..
Paul Jackson, Mark Westley, Alan Rayment and Matt Smith for completing their three peaks challenge, with Darren Yido Curtis driving, They have raised approx. 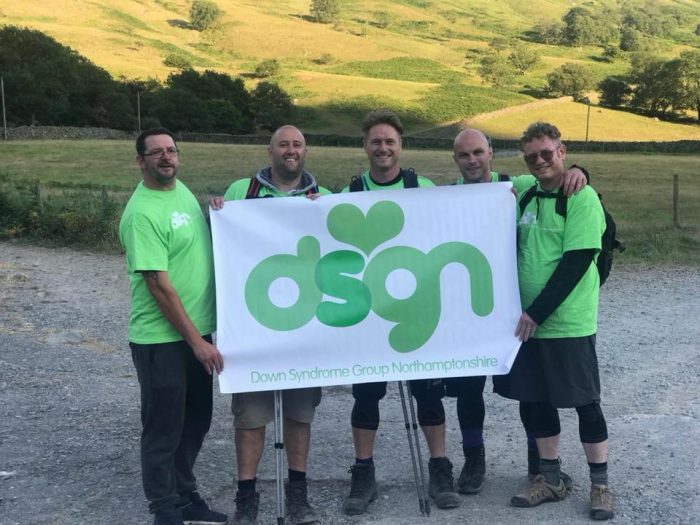 £2,000 for DSGN. This year we have had lots of publicity with mismatched socks day. DSGN held a stall at Weston Favell Centre we had lots of members, The Cube Arts Academy and Jenny from sing and sign help out on the stall, a massive thank you to everyone involved, whether it was volunteering on the stall, giving donations or supporting with fundraising. Group session for The Lucky Few Tattoo at Phil’s Tattoo, Bridge Street 17th March 2018 Kirsty was approached by Gillian Falcone and family about members getting together to get The Lucky Few Tattoo, 22 members including relatives and friends joined us to get different variations of the design. James Clark managed to organise a great deal with Phil for the event. Thank you to Phil’s tattoos for everything they did on the day and Thank you to everyone who came along on the day to get inked or offer support. Wickstead Park – Saturday 23rd June – Adult wristband £6, Child wristband £5, person with DS goes FREE. There will NOT be a coach for this event, but if transport is an issue please contact kirstycurtis4@hotmail.co.uk and we will try to help wherever possible. We will meet at the main gates for 10am to get wristbands then you are free to explore the park as you wish, we will gather for lunch in the main field at 12.30pm but this is optional. DLA proof required. West Midlands Safari and Theme Park – Sunday 15th July – Adult price £10, child price £9, for this event we ask that you pay for the person with DS and you will get ONE FREE CARER. There will be a coach provided for this event charged at £5 per person, person with DS travels FREE. If you require transport for this event please state this on booking form. This is entry to both the Safari Park and the Theme Park areas. Coach will pick up from Upper Mounts Car Park please arrive in time for departure at 8.45. Leaving Safari Park at 5.30pm DLA proof required. Summer BBQ – Sunday 16th September, Venue: The Freemason’s Hall, Lodge Farm Industrial Estate, Duston, Northampton NN5 7UL. 1-4 pm. A separate invitation will be sent nearer to the event. Christmas Party – Saturday 8th December, 12-3pm at County Cricket Ground Old Speckled Hen Suite – Separate invitations will be sent nearer to the event. Panto, PETER PAN – Sunday 16th December 1pm – Take a fairy tale flight to Neverland in the swashbuckling family adventure Peter Pan. Join our high-flying hero as he transports the Darlings on an adventure they will never forget full of evil pirates, the lost boys, a very hungry crocodile and the meanest man in Neverland, Captain Hook. Emails will be sent for this event separately. Please find booking form attached. We look forward to seeing your family at some of this year’s events. Thank you to 4mation fitness, Byfield School, Guilsborough C of E Primary, Fountain of Knowledge Montessori Nursery and Matt Cockburn and colleagues for their recent fundraising. Summer BBQ – Sunday 9th September, Venue: The Freemason’s Hall, Lodge Farm Industrial Estate, Duston, Northampton NN5 7UL. 1-4 pm. A separate invitation will be sent nearer to the event.